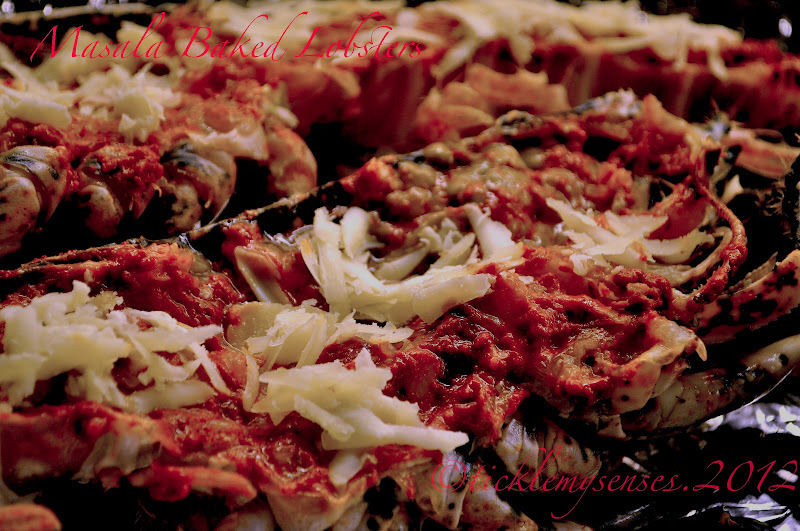 Tickle My Senses: Masala Baked Lobsters. This hot and spicy baked lobster preparation is a change from the usual Garlic Butter Herb Lobster, or Lobster Thermidor. 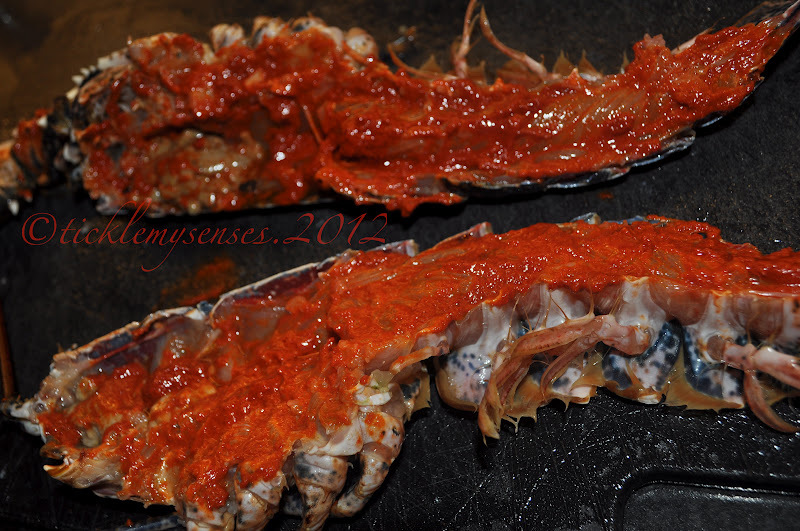 This is yet another recipe, where the traditional Mangalorean Chilli paste/ Meet Mirsang paste comes to use. 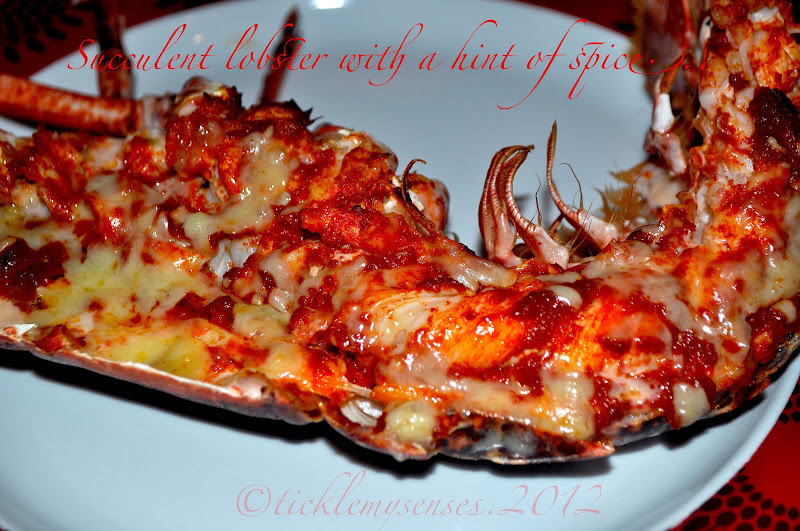 A thin smearing of the Meet Mirsang/ Chilli paste over the cut surface of the lobster followed by a a generous sprinkling of mature cheddar cheese, when baked creates a wonderfully flavoured lobster. With each bite you will taste the sweetness of the lobster flesh, heat and sourness of the Mangalore Meet Mirsang/ Chilli paste, complimented beautifully by the creamy saltiness of the cheese topping. A must try. Ingredients: Serves 2 as a starter. 1. Prepare the Mangalore Chilli paste (If using the instant version skip the rice flour while making the paste). Taste mixture for salt and sourness, adjust accordingly. Add oil to the chilli paste. Keep aside. 2. Divide the lobster using a sharp knife into two halves in the middle. (For video on how thats done go here . Remove or clean away the digestive tract, the gills, the circulation system, and green "tomalley"(the digestive gland). Or get your fishmonger to do it for you. Then give it a gentle rinse under running water. Dry the lobster meat using tissue paper. 3. Apply half of the prepared Mangalore Chilli paste to one half and the remaining to the second half. Make sure every bit of the lobster meat gets a smearing. Sprinkle over the grated cheddar cheese. Place the prepared lobster on a baking sheet. 4. Bake at 180 for 5-7 mins or till the outer shells turn orange. Serve hot with a wedge of lemon and a portion of crispy fresh salad on the side.